Few accessories seem quite as evocative as the silk top hat. As the essential headwear of Victorian gentlemen and a modern statement of aristocratic wealth, the silk top hat now faces a sad decline as the few limited examples large enough to fit modern heads mean the style is set to become even more exclusive. A Very Large Vintage Silk Top Hat, Lincoln Bennet & Co, Size XL UK 7 3/8, (60cm). On Ebay for £1,495. The silk top hat has therefore inspired an intensely competitive market for original silk top hats that haven’t been made for half a century. While many collectors simply want hats to wear with their formal outfits, events like Royal Ascot mean a large number of very wealthy people enter the market each year. That sounds a healthy balance, except that silk top hats are subject to further complications. Examples large enough to fit modern heads are extremely rare and while you can easily find a small one for under £100 a large top hat can be worth thousands. The other factor is that silk top hats are easily damaged and so condition is everything. That means silk top hats large enough to wear and in good condition for formal occasions are only going to get rarer. Some collectors are even buying every antique top hat they find as a potential investment. Just like oil and bitcoin, when the market runs dry of a limited commodity consumers turn to whoever can supply. A quick Ebay search reveals plenty of hats for around £100-200 of about 56cm diameter. But when we consider the average modern man has a hat size of 58cm the price suddenly hikes up dramatically. Antique Victorian Vintage Black Christy’s Of London Silk Top Hat C1900 Sz 6 7/8 (56cm). On Ebay for £595. In a way this represents a sad state of a dying piece of fashion history. Many costume fanatics will surely agree that the silk top hat is one of the most beautiful and inspiring pieces of menswear. The hat was born in London’s St James on February 17, 1797, when a gentleman named John Hetherington walked with what a police officer recorded as “a tall and shiny construction on his head that must have terrified nervous people. The sight of this construction was so overstated that various women fainted, children began to cry and dogs started to bark. One child broke his arm among all the jostling.” Hetherington was actually arrested for causing a disturbance with his headwear but just 30 years later it had become the height of fashion with even the king wearing one. Today the top hat is an icon for fans of Victorian and Steampun fashion, not to mention certain modern elite circles. Nevertheless even today the attention drawn by the tall hat can put it at threat. What is Your Top Hat Worth? Of course the value of top hats is no exact science and the examples pictured here show vast variations in price. Traders haven’t been reporting trends around the world and no two silk top hats are ever going to be identical, so don’t take any of this as genuine financial advice. Condition is paramount and size follows closely behind, not to mention age and branding. It was tempting while writing this to plot a graph of size and retail cost of antique top hats in good condition but there are simply too many variables at play – and that’s before we get to individual sellers’ judgements and what different buyers are willing to pay. Maybe some day a manufacturer will try to regain the lost art of manufacturing silk plush, in which case prices could fall. Ultimately if you have an average to large-sized head and you find a hat that you can afford then definitely go for it while you can. See what bargains you can find ending now that others might not have seen! 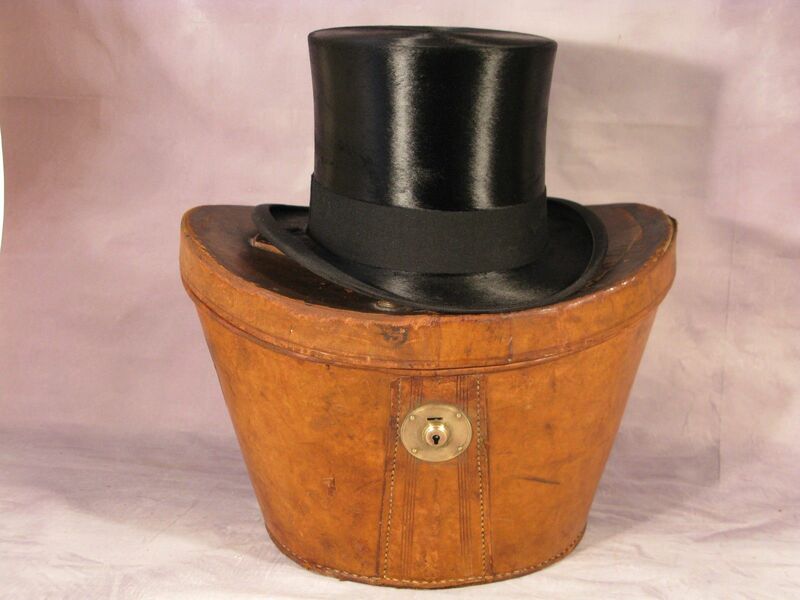 Header image: Antique Edwardian vintage black Lincoln Bennett London silk top hat with leather case – Trafalgar Antiques.